Elly McCausland presents her entry to this year's Godiva Chocolate Challenge - a sumptuous dark chocolate ganache tart, set in a beautiful hazelnut pastry. Nestling inside the meringue and raspberry ice cream is a hint of pink peppercorn for a spicy surprise. My entry for the Godiva Chocolate Challenge emphasizes the luscious simplicity of molten dark chocolate. Blended with thick double cream and a pinch of vanilla salt, a dark chocolate ganache sets to quivering silkiness in the heat of the oven, surrounded by a short, buttery hazelnut pastry that evokes the taste and aroma of crunchy praline and reflects the origins of Godiva as a producer of exquisite pralines in Belgium, nearly 100 years ago. 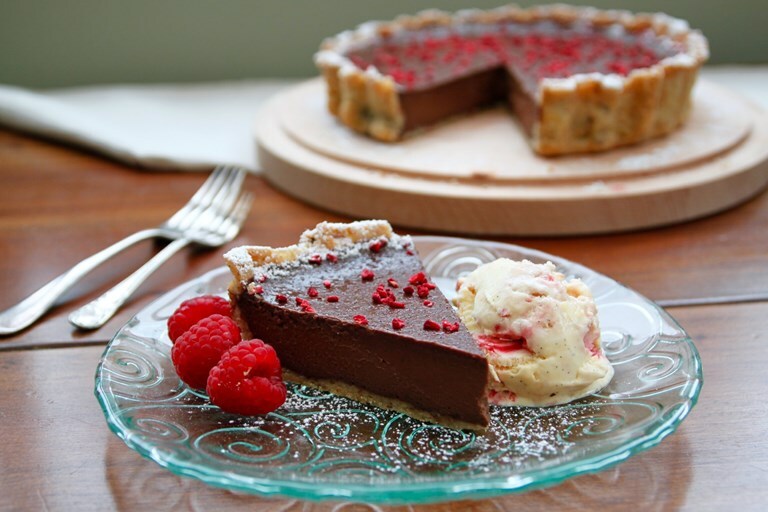 The combination is given depth and freshness by a scattering of freeze-dried raspberries, little pink shards that glisten like jewels on top of the dark ganache. It’s velvet-smooth, luxuriously rich and not too sweet, emphasizing the complex interplay of flavours found in dark chocolate. For me, this recipe is all about simplicity and emphasizing the purity and complexity of high-quality chocolate: this tart highlights that simplicity, allowing nothing to complicate the aromas of the dark chocolate other than cream, eggs, sugar, and a little vanilla salt to lift the flavours. The sweetness comes from the accompanying ice cream, featuring two essential components: meringue, to celebrate the launch of Godiva’s new Mousse Meringue collection; and a touch of pink, to reflect the fact that 10% of its sales will go to Breast Cancer Now. The ice cream base is simple cream with a generous infusion of fresh vanilla, churned until thick and then rippled with crisp crumbled meringue and a tangy raspberry coulis. For an extra touch of pink, I’ve enhanced the coulis with a smattering of crushed pink peppercorns, dried berries with an incredible spicy, citrus flavour. They emphasise the natural sharpness of the raspberries and cut through the sweetness of the custard and meringue. Pink peppercorns also work wonderfully with dark chocolate, emphasizing its layers of spicy, floral aromas. 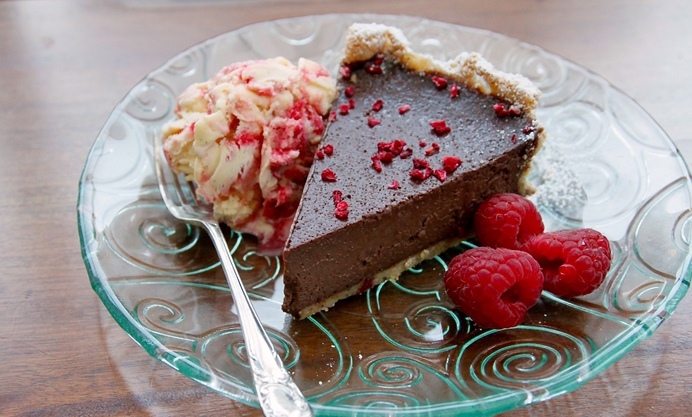 The ice cream pairs perfectly with the bitter chocolate and the nutty pastry, cutting through the richness of the ganache. It’s delicious on its own, but provides a beautiful contrast with the tart, both in terms of taste and aesthetics: I love the summery pink and white rippled colours, reminiscent of that retro classic Arctic Roll, but made infinitely more grown up and luxurious by being paired with a very sophisticated, dark and delicious chocolate tart.